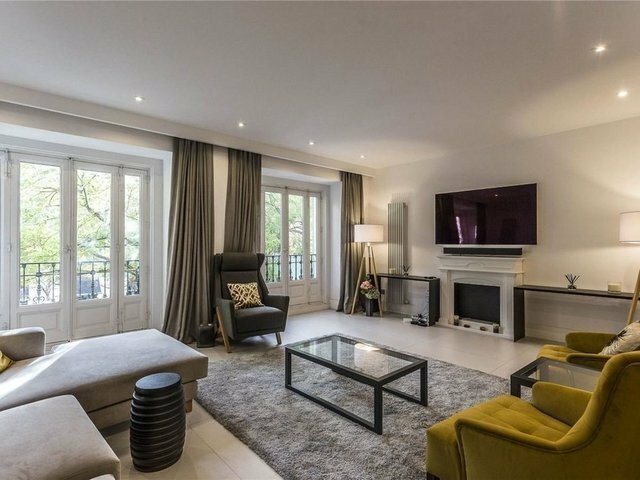 This large apartment is situated in the middle of the Golden Mile, and is set amongst the most exclusive shopping and dining options that Madrid has to offer. The property has been recently refurbished to a supremely high standard using the latest technology and high-quality finishes. Furniture is included in the sale. Built in the 1900s, the apartment is located in a beautiful classical building. It has a built area of 282 m² and offers south facing views onto the street. On entering the property, we find the bright and modern living-dining areas which are separated by a small partition wall. To the left is a long hallway that leads to a very large, modern open-plan kitchen. Further along the hall is the large master suite. At the end of the hall are 2 further bedrooms, each with en suite bathrooms. All bedrooms are fitted with walk-in wardrobes. This apartment would appeal to all types of buyers due to its location, size and condition.